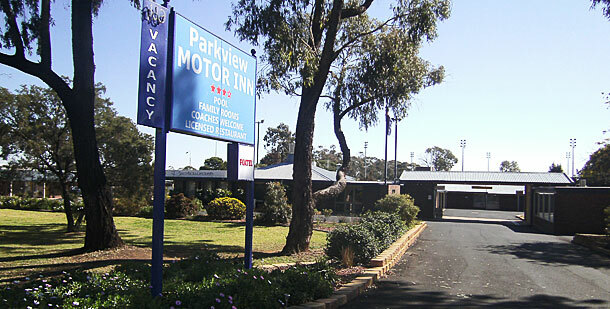 Parkview Motor Inn is conveniently located on route between Melbourne and Brisbane on the Newell Highway A perfect stop over. We are 1 minutes’ drive from the main street of Parkes and the Parkes Visitor centre. Our nearest junction is Baker St and the Newell Hwy Parkes. We are a 5 min walk to the Parkes railway station. Follow the Orange Rd (90) to the Newell Hwy turn left following signs to Forbes. Once you have crossed over the Railway track go past the service station on your left and the motel is about 200 metres up the road on your right hand side. You will see a big blue sign – Parkview Motor Inn. We are opposite the nursery. Follow the road to Melbourne on the Newell Hwy go all the way through town. Once you have crossed over the Railway track go past the service station on your left and the motel is about 200 metres up the road on your right hand side. You will see a big blue sign – Parkview Motor Inn. We are opposite the nursery. Follow the road to Dubbo on the Newell Hwy just as you hit the Welcome to Parkes signs on the edge of town, the motel is about 500 metres on your left hand side. You will see a big blue sign on your left – Parkview Motor Inn. We are opposite the nursery. If you have crossed over the Railway track you have gone too far, turn around. Follow the Condobolin Rd into Parkes. At the junction of the Newell Hwy and the Condobolin Rd turn Right, you are on the Newell Hwy. Follow the signs to Forbes. Once you have crossed over the Railway track go past the service station on your left and the motel is about 200 metres up the road on your right hand side. You will see a big blue sign – Parkview Motor Inn. We are opposite the nursery.